"Sir, things are becoming more and more difficult." Labour MP for East Ham, and Shadow Minister for Employment Stephen Timms received a startling letter from a young constituent. 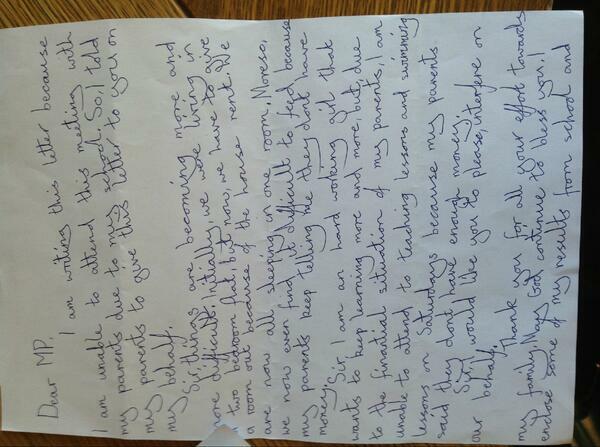 Extraordinary letter from an eight year old, delivered to me by her parents at my surgery yesterday morning. I am writing this letter because I am unable to attend this meeting with my parents due to my school. So, I told my parents to give this letter to you on my behalf. Sir, things are becoming more and more difficult. Initially, we were living in a two bedroom flat, but now we have to give a room out because of the house rent. We are now all sleeping in one room. More so, we now even find it difficult to feed because my parents keep telling me they don't have money. Sir, I am a hard-working girl that wants to keep learning more and more, but due to the finantial [sic] situation of my parents, I am unable to attend to teaching lessons and swimming lessons on Saturdays, because my parents said they don't have enough money. Sir, I would like you to please, interfere on our behalf. Thank you for all your effort towards my family. May God continue to bless you. I enclose some of my results from school. Timms told the Independent: "It's difficult to draw any wider implications from this letter but certainly there are a growing number of people on the verge of destitution because of the bedroom tax, welfare reforms and immigration changes." Timms supports a number of homelessness support schemes in his constituency. "Over the past few months my office has dealt with an increasing number of homeless cases where the state is able to provide little or no assistance. Often people contact my office late in the day as a last resort or after spending their first night sleeping rough." According to research published by The Campaign To End Child Poverty, in Newham, 32 per cent of children are in poverty.